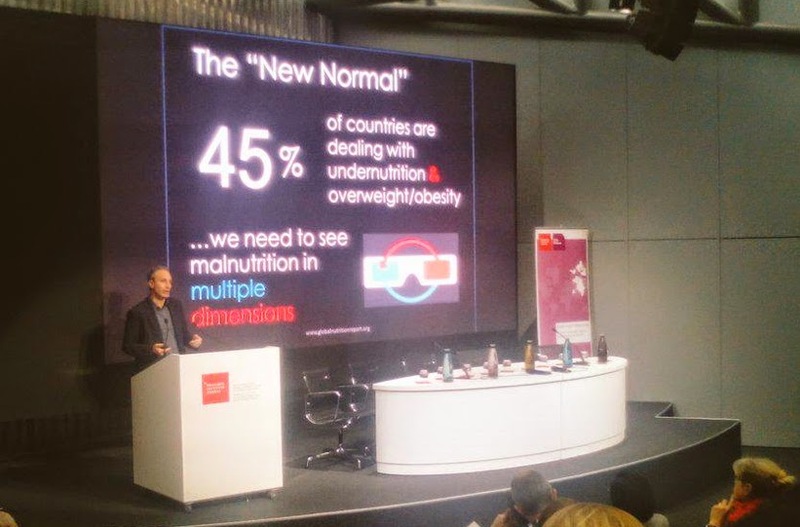 We had a really interesting launch of the Global Nutrition Report in Geneva on January 28. Hosted by The Graduate Institute and convened by WHO, the UNSCN and FAO, the event drew about 140 people. Prof. Ilona Kickbusch chaired the event expertly. We had a great panel including representatives from the Global Nutrition Cluster, the Finland Government, GAIN and the SUN movement. The panelists said what they found interesting about the 2014 Report and what they would like to see in the 2015 Report. * We need more on how diet choices are affecting health and the environment. What is the evidence on interventions aimed at shaping those choices? * More on links with the humanitarian space: how many nutrition plans include preparedness and response? Do multisectoral platforms have relevance or work in emergency settings? As you can see: more, more, more. Well, we will do our best. An interesting point was brought up by one member of the audience: “Is it possible to work on nutrition without using the word stakeholder?” The question was centered round the role of the private sector. By including them as a stakeholder in nutrition status, were they being given an equal seat at the table, a table discussion that they could influence disproportionately because of their power relative to other stakeholders? Should they be called partners and should they be setting priorities? * Business has a big stake in nutrition. If they behave responsibly they will promote the health of their workforce and their customers. They are already deeply involved in shaping nutrition outcomes. They represent at least 60% of economic activity in most countries. They are stakeholders, like it or not. * Should they be called partners? The word partner implies some equality of power, mutual accountability, and clearly defined roles. If these things are in place then the word partner is reasonable, it seems to me. I think many people have a problem with the word because often these things are implied by the word when they are, in fact, not in place. * Business should not be in the business of setting public health priorities. That is what our elected representatives are supposed to do and we can hold them accountable for that. Should businesses even be allowed to influence the priority setting process? This is more difficult. They do already attempt to (and surely do) influence the process in the corridors (witness the ICN2) and behind closed doors. We should try to bring this influencing into the sunlight as much as possible so that we can hold business accountable for their influencing and public sector representatives accountable for their response. Another point was made: can human rights be the basis for the GNR 2015 report? My response was, human rights are one important basis for nutrition promotion. People’s rights to food, care and health need to be respected, protected, promoted and ultimately fulfilled. 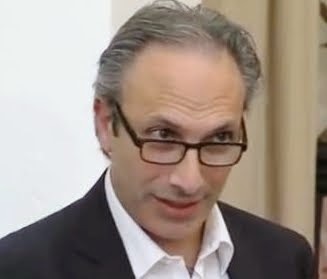 But there are other arguments that are also strong, such as the economic basis (one of the government representatives at the event said “money talks” and this is, in my experience, true). There was a strong point made around commitments: it is not only what you commit to do, but what you commit not to do. This is a point well taken and we will think about how to build this in to our accountability work. It is clear that the 2015 Report is going to suffer from the “difficult second album” syndrome whereby expectations have been raised by the debut but there is only so much new material available for the second. Everyone wants the GNR 2015 to do everything. We are working hard to do something manageable, which is a complement to the GNR 2014. Growth is Dead. Long Live Growth! Does the Quality of Growth Matter? Yesterday I was at the launch of the new book “Growth is Dead. Long Live Growth! 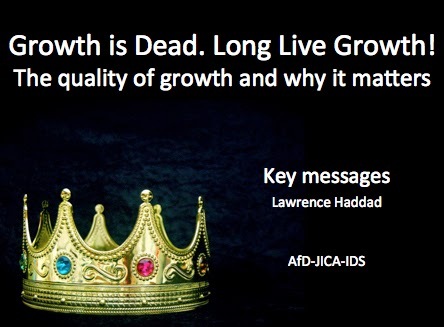 The Quality of Growth and Why it Matters” published by JICA, AFD and IDS (Editors: Haddad, Kato and Meisel). The book is a collection of papers looking into the different dimensions of the quality of economic growth: for example when does it reduce poverty, undernutrition and unemployment and minimize the emissions of greenhouse gases? My introductory powerpoints are here. The table of contents is here. The overview chapter is here. The full book will be available online in early February. My takeaways from the launch. 1. Do we need growth? Someone in the audience asked why we needed growth at all. A good fundamental question. Low and middle income countries want social services that high income countries take for granted. That takes money and much of that will have to come from taxes, taxes taken from increased personal and corporation income flows. But the high income countries need growth too, as their dependency ratios increase due to aging populations. If people in these countries are not willing to work many more years, then growth is needed to fund longer retirements. 3. What about business? In most countries businesses are responsible for 60-70% of economic activity and why should they invest in higher quality growth? Piketty’s arguments about capitalism and inequality rest on the fact that the returns to investment in capital are higher than the returns to human capital and the gap has been widening. Are there institutional innovations that could create greater incentives for firms to invest in human capital? But firms don’t “own” their employees, so what is their incentive to invest in employees if they might just up and leave? One way of minimizing this risk would be for employers and employees to split the costs of training if the employee leaves before a pre-specified time. 4. On measurement we talked a lot about all-encompassing indices that wrapped everything up into one mega-measure of quality. These will always be contested and difficult. Perhaps a simpler approach would be to specify the resource use per unit of growth, or flipping the numerator and denominator, asking how much poverty was reduced by a unit of growth. These simpler measures might make the measurement debate less charged. 5. Politics is so important. If citizens get the politicians they deserve, perhaps we also get the growth we deserve. In other words we can choose the growth we get. Options around the rules that govern markets need to be more explicit and the choices made more transparent. So don’t moan about the quality of growth, push your elected leaders to do something to improve it. It might even improve the quality of their electoral hopes. What does a healthy and sustainable food system look like? Ever since ICN2 (which seems like a long time ago) I have been wondering what exactly a healthy and sustainable food system looks like (I know, I need to get a life). A few friends sent me some papers (no comment on their need to get a life) and here is a quick summary of two that I enjoyed reading. The paper characterizes 4 diets (by region): conventional Omnivorous diets (eat everything e.g. global average diet or an income dependent diet which is a projection of current global diets driven by projected income growth), Mediterranean (rich in fruit, veg, seafood, includes grains, sugars, oils, dairy, eggs, and moderate amounts of different meats), Vegetarian (includes not more than one serving of meat or seafood per month), and Pescetarian (vegetarian plus seafood). The authors use 10 million person years of observations across 8 study cohorts to look at the health effects of these 4 different diets. They then link these 4 diets to greenhouse gas (GHG) emissions and cropland use. The biggest contribution of the paper is that it links diet types to environment AND to health outcomes. There are no terribly surprising results. 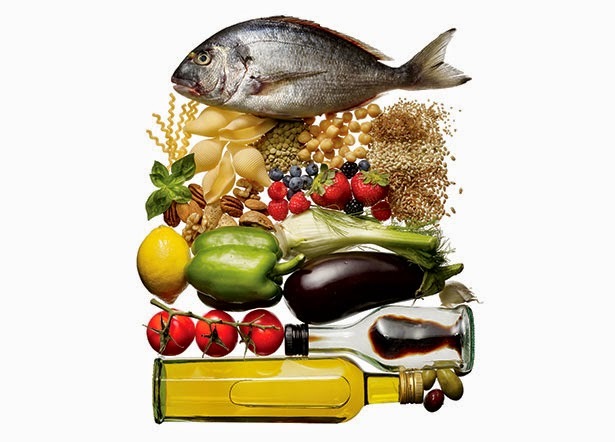 Per capita greenhouse gas emissions of the current Mediterranean diet are similar to current omnivore diets, but lower than the 2050 projected omnivore diet. The Pescetarian diet is next lowest in pc GHG and then the Vegetarian diet is the lowest at about half the pcGHG of the 2050 Omnivore diet. The authors are careful to state that healthier does not automatically mean more environmentally friendly and vice versa. They also stress that food choices are determined by culture, knowledge, price, availability, taste and convenience. They also note that there are many other diets they could have looked at. They don't say much about how their 3 diets are to be adopted and adapted -- and this is crux. Elke Stehfest has a viewpoint article in the same edition of Nature commenting on the Tilman and Clark paper. Stehfest goes a bit further on this front, breaking it down into individual choice but also to the environment in which choices are made. Making healthy (and sustainable) choices can be made easier or harder by regulation and policy. My perspective is that if individuals have the ultimate responsibility on the former, Governments have the ultimate responsibility on the latter. Businesses also need to assume responsibility for providing healthier and sustainable choices for those who demand it and for making the choices easier for those who are on the brink of demanding it. Ultimately do they want their customers and employees to be able to make sustainable and healthy choices (and survive!) or are they only interested in the short term? This paper is a lot older (and actually ahead of its time). It also makes the connection between health and environment via diet, focusing more on meat consumption. It notes that meat consumption in 2005-6 in high income countries was around 225g per person per day (yep, half a pound per day--on average). They also note that pastoral livestock systems emit more GHGs than intensive systems (although it is not clear what the denominator is here). A "tapering" of consumption increases of meat in the low and middle income countries. I think this means a lower growth rate of meat consumption. They argue that for the high income countries, food consumption should not be any more exempt from policy than driving or flying when it comes to efforts to curtail the growth in GHGs. For the low and middle income countries they stress that "growth now, green later" simply may not be an option because non-green growth now could mean low or no growth in the future. It seems to me that until we can provide national policymakers with a list of a few specific things they can do (such as reducing state support for growth of animal feed and investing more in the R and D behind the low cost production of fruits, vegetables and fish) and then cost these out in terms of benefits versus costs, this issue will never even get a set at the table to plead this case. My sense is that this movement will be driven by national governments rather than international governance. How to guide diet choices towards health and environmental goods? We have the general evidence, now we need the country-specific evidence -- and guidance for national policymakers on what to do. Yesterday I participated in a Twitterchat organised by 1000 Days, with Asthma Lateef from Bread for the World Institute and Werner Schultink at UNICEF. It was a fun Twitter frenzy and in the course of the chat I put out 10 stream of consciousness tweets about what anyone can do to fight for nutrition's place at the table in the post 2015 sustainable development framework. Here they are. What would you have tweeted? 7. tell your local businesses about #malnutrition if they serve junk to kids--tell them. 10. support @action2015! 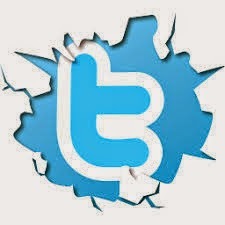 tweet, RT, MT. Go 2 meetings & rallies..Change is hard. The rewards are great. Do it for nutrition. The recently released Global Nutrition Report produced 193 Nutrition Country Profiles. Each 2-page profile aims to have data on 82 nutrition related indicators. Of course many of the indicators have no data, but most have a wealth of information. But how useful are they? We had a request for a briefing from a prominent journalist who is visiting Angola and I thought it would be a useful test case (admittedly n=1) to see how useful the Angola Nutrition Profile is (and I know very little about Angola). So what does the Angola Profile say? 1. Angola's economy is growing fast (GDP/capita PPP more than doubled between 2000 and 2013). 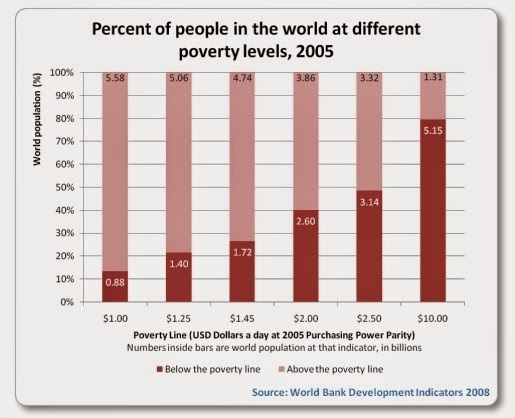 We only have poverty rates for 2000 (54% below $1.25 a day--note, there is a mistake in the Profile with the two poverty rates have been transposed--we will fix). As an aside: much of this economic growth is due to the oil industry, hence very dependent on oils prices which are very low right now--so the economy is particularly susceptible to economic volatility. 2. Angola is 58% urban. Income inequality is very high. Angola's Gini coefficient is 59--only South Africa and Lesotho are higher--Brazil is around 53. 4. Anemia in women of reproductive age is high at 45% which is in line with rates in Middle Africa (45%). Under 5 vitamin A deficiency rates are very high at 64% but the data are very old (1999). Vitamin A supplementation coverage is low at 44% (in 2012). For a predominantly urban population iodised salt coverage is also low at 45%. 6. At the underlying levels, gender inequality data are missing, but female secondary education enrolment data are low (25%) compared to the all Africa average of 53%. The availability of community health workers is low (1.66 per 1000 people) but in line with all Africa averages. Undernourishment data (proxies for hunger) show steep declines from 2000 (49% hungry) to 2014 (18% hungry) but these estimates are very sensitive to assumptions about inequality which is very high in Angola and so they should be treated with caution, especially in the absence of poverty trends. Access to improved water has increase (42% to 55% between 1990 and 2012), but this is slow compared to other countries. Unimproved sanitation and open defecation were 71% in 1990 and 40% in 2012--a decent rate of decline, but with plenty of work to do. 7. In terms of Government commitment, Angola is not a member of Scaling Up Nutrition. Government expenditures on education are low (5.3% of total expenditures) compared to other African countries (12%) while health is low (4.1%) but in line with the all-Africa average (5%). The International Code of Marketing of Breast Milk Substitutes is not being implemented at the national level, maternity protection is partial, the protection and respect for the right to food is medium, no protocols/guidelines/standards are available of the management of non-communicable diseases and national development plans hardly feature nutrition (ranked last out of 83 countries). 1. Declines in stunting are rapid. Wasting declining too. Micronutrient malnutrition is high. 2. 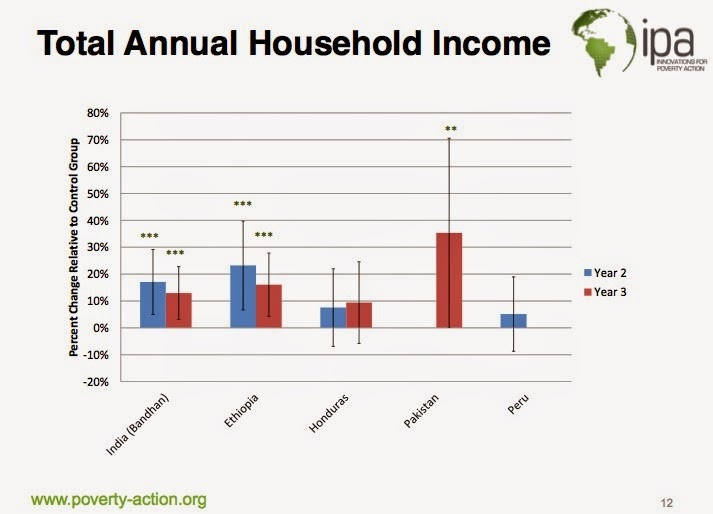 Economic growth is high, inequality also very high. Highly urban. 3. Coverage rates of nutrition programmes: could do better. Exclusive breastfeeding rates very low. 5. Commitment to nutrition? Seems quite low. Spending low, nutrition does not feature in development plans, no national implementation of breast milk substitute marketing code. .. the commitment to nutrition improvement needs to increase. The new funds coming into the exchequer can be used to improve female secondary education enrolment rates, reduce open defecation, increase nutrition programme coverage, promote exclusive breastfeeding. The government should seriously consider joining SUN. To do this will require (a) good governance of oil revenues to make sure there are funds flowing into the exchequer and (b) a commitment (and plan) to spend more of those funds on nutrition. Civil society and external partners have a big role to play in helping (a) and (b) materialise. Angola could be a real nutrition success story--but only if it wants to be. Reflections on the Nutrition Country Profile? I am biased, but I found it very useful to have everything in one place. The only downside is that I often wanted to understand the Angola values in relation to all Africa averages and for that I had to revert to the Report. We will think about how to resolve this issue. One of the less highlighted panels in the Global Nutrition Report is Panel 2.4 by Lisa Smith and me. We downplayed the panel because it was based on an article that had not yet been published in a peer reviewed development journal. Well now World Development (Smith and Haddad 2015) has published it (here). I have blogged on the paper before when it was an IDS Working Paper, supported by funding from Transform Nutrition, with the findings of the paper summarised here. Rather than go over the results I want to highlight the panel from the Global Nutrition Report. The panel (below) uses the econometric results from the paper to understand how realistic it is to meet and exceed the WHA stunting target. For those of you who do not have the time to go through the text below the bottom line is that (a) we can exceed the WHA stunting targets by meeting challenging but realistic targets for the underlying determinants, (b) many countries have already met these targets for the underlying determinants (see footnote 2), (c) the biggest increases in rate of improvement of underlying factors needs to come in sanitation and women's empowerment and (d) all of the projections assume no scale up of the vital nutrition specific interventions--if these are scaled up then the picture becomes even more positive. The nutrition community needs to think positively about meeting the WHA stunting target. We are not so far off meeting it with business as usual. We need to step up our efforts. Panel 2.3 in Global Nutrition Report: Can improving the underlying determinants of nutrition help meet the WHA targets? Using a multi-year sample covering 1970 to 2012 and 116 developing countries (accounting for 96% of the developing world’s population), panel regression estimates were generated for the associations between stunting prevalence and six underlying determinants of stunting: access to improved water, access to improved sanitation, female secondary school enrolments, gender equality as represented by the ratio of female to male life expectancy, dietary energy supply, and the share of the dietary energy supply derived from non-staple foods (Smith and Haddad, 2015). The regression model (1) can be used to predict stunting prevalences based on different assumed levels of the six underlying factors. The first table describes three scenarios for the 116 low and middle income countries. Scenario 1 assumes current (2010) levels of the six underlying drivers, and these predict a stunting prevalence virtually identical to the actual stunting prevalence (29%). Scenario 2 increases the six underlying determinants from their 2010 levels to those that together achieve the WHA stunting target of 15% by 2025. Scenario 3 leaves predicted stunting at below 10%. The levels of determinants are challenging, but several low and middle-income countries have attained them already (2). What about the rates of increase in these determinants? The rates of increase in the six underlying determinants over the 2000-2010 period are given in the table below. The rates of increase needed to achieve Scenarios 2 and 3 are also presented. Except for equality of life expectancy, the required rates of increase in the underlying factors to meet Scenario 2 are not unrealistic compared to recent historical performance. The required rates to achieve Scenario 3 are larger than they have been in recent years. However, this analysis fails to take into account any scale-up of the critical nutrition-specific interventions. If these are indeed scaled up, and their effectiveness improved, the potential to exceed the WHA target at the global level is significantly improved. (1) The regression model (6 proxy underlying determinants, country dummy variables and time period dummy variables) predicted much of the variation in stunting and was stable over time (pre and post 2000). (2) For access to improved water source, Brazil (2006) had a level of 95%; Viet Nam (2011) had access to improved sanitation facilities of 76% and Sri Lanka (2006) had 89%. For female secondary school enrolment South Africa (2008) posted a rate of 95% in 2008. For the ratio of female life expectancy to male rates, Indonesia (2004) was 1.06, Honduras (2005) was 1.07, and the Central African Republic (2010) was 1.077. For dietary energy supply, Ghana (2011) was 2934. Finally for the percent of dietary energy supply Guatemala (2008) was 49%, Brazil (2006) was 64%, Thailand (2005) 50% and Swaziland (2005) 45%. Here's a letter that I submitted to the New York TImes a few weeks back. It was not accepted. 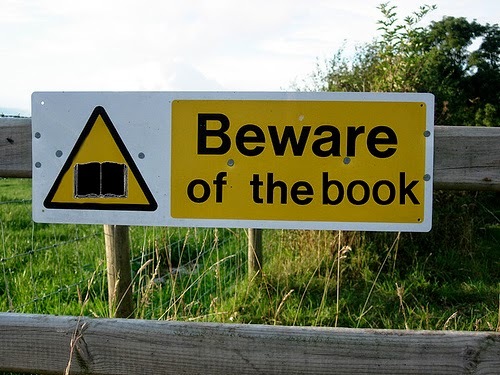 Please use the text where you feel appropriate. Dear Editors, in 9 months, world leaders will descend on New York during the UN General Assembly and proudly proclaim the beginning of the Sustainable Development Goals (SDGs) era. As the just released first-ever Global Nutrition Report notes, malnutrition is a serious health issue for every country on the planet. Despite this, malnutrition is in danger of missing the SDG boat. Out of 169 SDG targets, nutrition is mentioned only once. This, despite being responsible in one way or another for 45% of child deaths under 5 and global GNP losses of 8%. And we know what to do to turn the tide and what we will get in return. Investments in scaling up nutrition programmes will yield economic returns that beat the performance of the Dow Jones Industrial over the past 80 years. Something is terribly wrong with this picture. We urge all those who care about seeing shrunken and wizened children, baby coffins, morbidly obese individuals, and women rendered lifeless by anemia, to change the picture. Write to your congressman or woman, sign petitions, direct short videos, begin Twitter campaigns, talk to your spiritual leaders, call up your radio stations, tell your parents, children and friends: malnutrition affects all countries. Fortunately all countries can affect malnutrition through a series of interventions which are proven to be effective in reducing it--but they must hold themselves accountable for their efforts. That is achieved, in part, by getting more nutrition targets into the post 2015 development goals. After all, what is measured stands a chance of getting done.